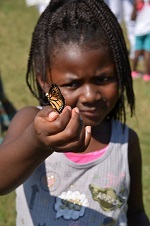 Butterflies n’ Blooms culminates with the tagging of over 1,000 monarch butterflies for release at Flutter Fest on Sept. 22 brought to you in partnership with Louisville’s Idlewild Butterfly Farm. This release coincides with the annual migration of monarch butterflies. Craft and activity stations: Children of all ages can play games and make crafts while learning more about monarchs and their long journey. Education stations: Visit stations to learn the importance of pollinators and what you can do to help them. Storytime plus Meet and Greet The Very Hungry Caterpillar: Hear the beloved tale of a particularly hungry caterpillar and meet The Very Hungry Caterpillar. Butterfly Talks and Release: Join us at 2 p.m. as butterfly expert Blair Leano-Helvey gives a talk on the importance of pollinators like monarch butterflies. Then watch as the sky fills with butterflies during the release of over 1,000 tagged monarchs. Pollinator Parade: Kids can join our special pollinator parade following the butterfly release at 2 p.m. If you don’t have your own wings, our gift shop has butterfly wings available for purchase. There will be special plant sales from our Butterfly partner, Idlewild Butterfly Farm.